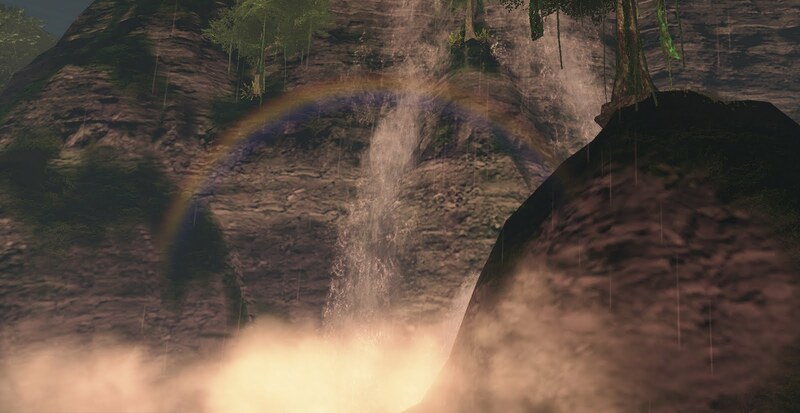 The lush forests and cascading waterfalls created by Micaela aka VRHacks in Digital DNA are a mere sample of the abilities of this multi-talented Blue Mars creator. Micaela has been a virtual world designer for more than 3 years, starting off in Second Life (under the name Angela Talamasca) with a crime scene recreation project in a Digital DNA sim, and eventually finding her way to Blue Mars. With Digital DNA in Blue Mars, Micaela plans to use the high-end graphics and large tracts of land to create a 3D build of a book she been working on. The book, as yet untitled, is a “blend of a poetry anthology (containing a collection of poems & parables that I've penned over the past 4 decades, of which a few have actually been published) and a story revolving around what I refer to in the book as "The Great In-Between” (where reality meets illusion)". Micaela first had the idea to write the book in the 1980’s after taking an honors physics course. Micaela began her professional training in the engineering field, studying hardware engineering, physics and math, but she eventually returned to school to pursue a Masters degree in Forensic Psychology. When she isn’t designing for one of her digital projects, she assists with crime scene investigations as a criminal psychological profiler. She is also working on developing conversational AI in her spare time. Digital DNA is an artistic endeavor for Micaela, rather than an entrepreneurial one. “For me, the virtuality is akin to a 3D canvas, where I, as an artist, can paint my imagination,” she said. She designs with a rough idea in mind, but admits that she rarely knows that the final product will look like. “As with other artwork that I do, whether that be drawing, painting, or even writing stories, for example, I tend to approach it more from a free-flow, free-style,“ said Micaela. Micaela is working on a second Blue Mars City, Confluence, which she hopes to release early in the New Year. Confluence became a winter wonderland when Micaela needed a place to test her new snowboarding script (which is now live in Wildwood in Blue Mars! ), complete with virtual Northern Lights. Micaela also wants to incorporate themed museums into Confluence, and is looking into making rideable horses! Micaela believes virtual worlds can be a commentary on human nature. She thinks virtual worlds can be used to observe how people engage from a social perspective, and see territoriality and perception of self in action. “One thing that I've noticed with regard to people who engage in virtual environments is that they tend to want to "nest" (territoriality) and engage (socialize). They also like to have control over how they look, as well as building up their "living areas" (perception of self),” she said. She also believes that virtual worlds could be used as an institutional tool, to help orchestrate the transitioning process for people in mental health institutions or correctional facilities. Micaela envisions a virtual world experience that helps increase thought before choice. “This would be akin to your quest-like games, where people would be presented a problem, make a choice, and the scene would unfold based upon their choice. The design would have no "wrong" answers, per se,” she said, “Rather, the goal would be to teach people to internalize the practice of thinking about their options, as opposed to reacting to whatever situations they face." Micaela hopes to one day resurrect her crime scene recreation project, and encourages others to try their hand at designing for Blue Mars, but warns them not to expect a copy of SL. “Blue Mars has a very high learning curve with a paucity of documentation, however, it is definitely a platform worth exploring if you're interested in developing high-end products. Some of my friends tend to compare it to Second Life. I try to disabuse them of that idea!” she said. Visit Digital DNA in Blue Mars to see VRHacks' work for yourself! Be sure to take a ride in the speedboat and tour the City by air in the hot air balloon!